Skating, puck handling and shooting skills can be done from the various A Formations. In the B Formations players practice skills with partners in various areas of the ice. Individual offensive skills such as passing, shooting, rebounds, tipping, screening and individual defensive techiques like angling, checking, etc.. In the C formation players practice game situations from 1-1 to 5-5. 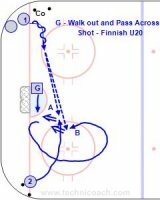 These drills start from different places on the ice and are coded C1, C2, C3. Use games to practice skills like skating, stick handling, defending, passing, shooting and also to gain game understanding. Play games with good habits like face the puck always or skate to open ice. Also practie team play skills like the give and go and cycling. Transition Games are continuous and the players go from offense to defense. Only one puck is used. They can be designed to work on any or all of the 4 Game Playing Roles. Drills that work skills of skating, passing, shooting, puck handlingand scoring. These are advanced skating exercises that focus on conditioning, quickness and agility. On ice goalie technique. Crease movement, rebounds, etc..
Video's from around the hockey world of players doing off ice training. T1 - Coach teaching individual offensive skills. T3 - Coach teaching individual defensive skills. Coach directed drills and games to Teach team play both even strength and specialty teams. These videos have been coverted to wmv files. Coaches talk about team play and handling a team. 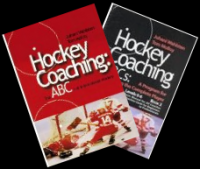 This program was developed to help coaches simplify the game. 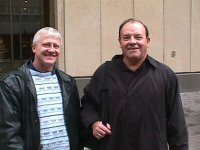 Enjoy the Game and The Game is the Great Coach are the two thems. There are 110 videos of drills and games for the beginning levels 0-1. 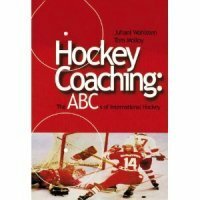 The videos with explanations of the skating and skill drills and games from Level Two of Hockey Coaching: The ABC's of International Hockey. College and International practices using efficient drills, skill games and transition games.